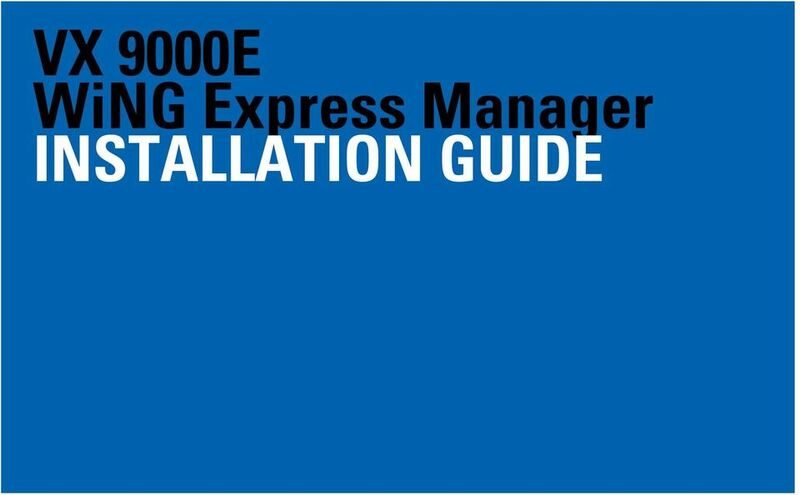 Download "VX 9000E WiNG Express Manager INSTALLATION GUIDE"
2 2 VX 9000E WiNG Express Manager Service Information If you have a problem with your equipment, contact support for your region. Support and issue resolution is provided for products under warranty or are covered by an agreement. Contact information and web self-service is available by visiting When contacting Support, please provide the following information: Serial number of the product Model number or product name Software type and version number Support responds to calls by or telephone within the time limits set forth in support agreements. If you purchased your Enterprise Mobility business product from a business partner, contact that business partner for support. Support Web Site Support, located at information and online assistance including developer tools, software downloads, product manuals, support contact information and online repair requests. 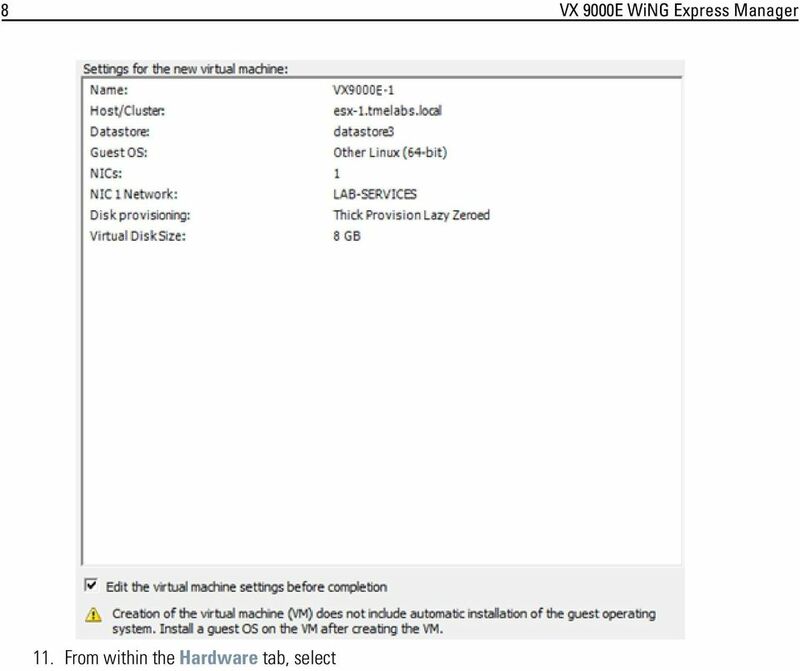 4 4 VX 9000E WiNG Express Manager Installing the VX 9000E WiNG Express Manager on a Hypervisor To license and install the VX virtualized controller: 1. Go to the Support site at 2. Refer to the Wireless Networks section in the lower, right-hand, side of the screen and select Get Software Downloads. 3. Select Option 2, All Other Wireless Products. 4. Navigate to the bottom of the screen and select (expand) the Wireless LAN option. 5. 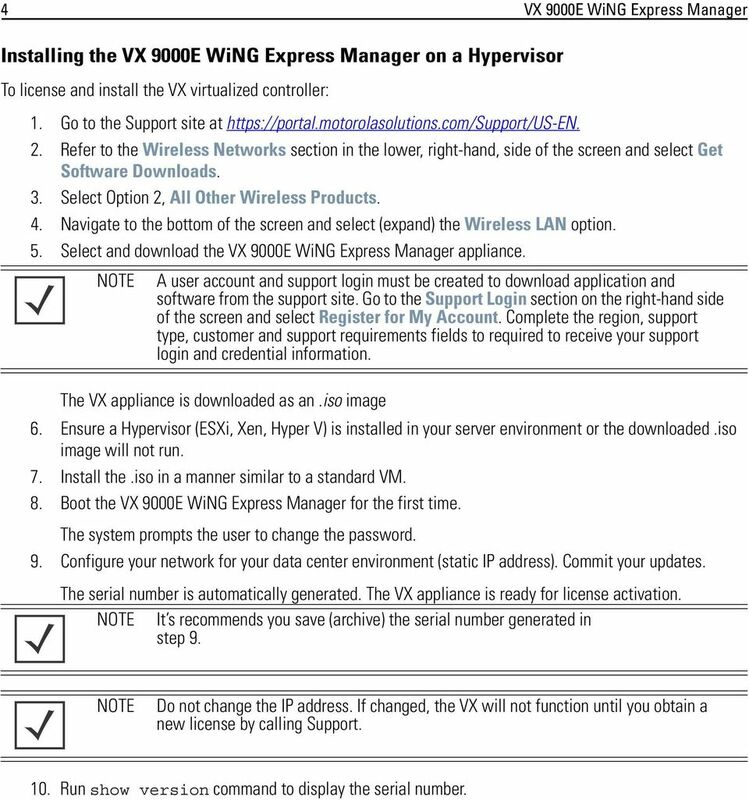 Select and download the VX 9000E WiNG Express Manager appliance. NOTE A user account and support login must be created to download application and software from the support site. Go to the Support Login section on the right-hand side of the screen and select Register for My Account. Complete the region, support type, customer and support requirements fields to required to receive your support login and credential information. The VX appliance is downloaded as an.iso image 6. Ensure a Hypervisor (ESXi, Xen, Hyper V) is installed in your server environment or the downloaded.iso image will not run. 7. Install the.iso in a manner similar to a standard VM. 8. Boot the VX 9000E WiNG Express Manager for the first time. The system prompts the user to change the password. 9. Configure your network for your data center environment (static IP address). Commit your updates. The serial number is automatically generated. The VX appliance is ready for license activation. NOTE It s recommends you save (archive) the serial number generated in step 9. NOTE Do not change the IP address. If changed, the VX will not function until you obtain a new license by calling Support. 10. Run show version command to display the serial number. 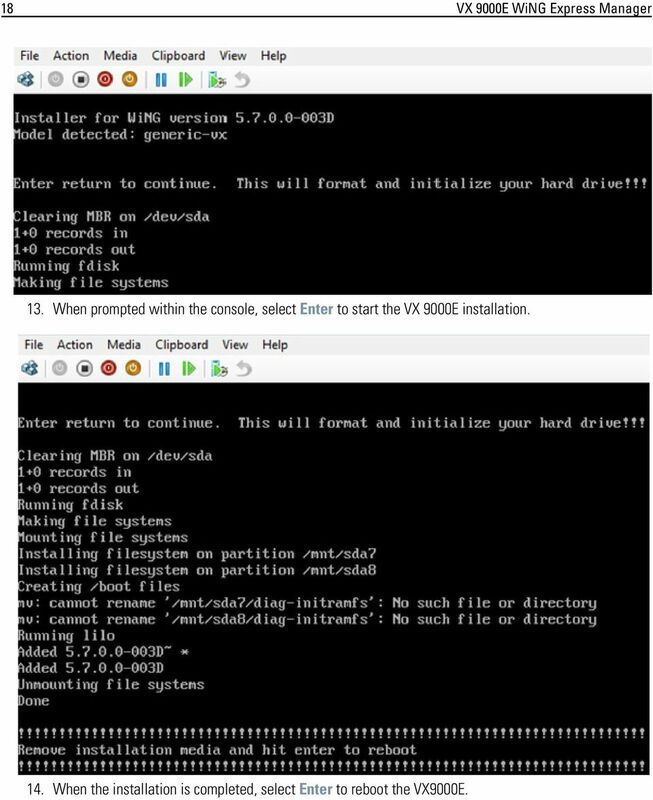 5 Installation Guide 5 Installing in an ESXi Environment To install the VX 9000E in an ESXi environment: 1. 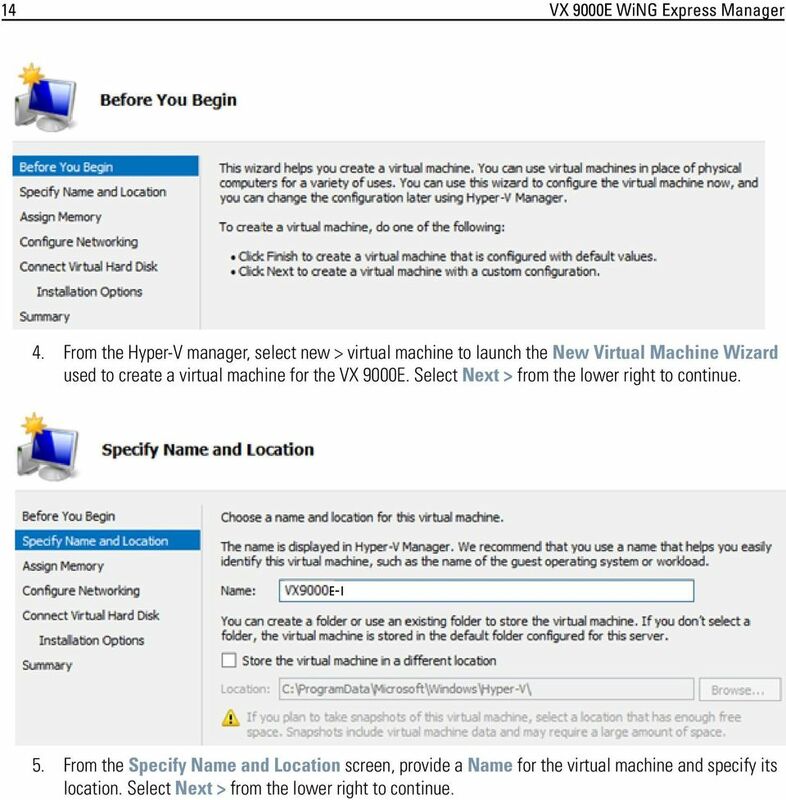 Within the vsphere client, select File > New > Virtual Machine. 2. Select Typical within the Configuration field, then Next > from the lower, right-hand, side of the screen. 3. Enter a 80 character maximum virtual machine name, then Next > from the lower, right-hand, side of the screen. 4. Select the target Storage location from amongst the destinations listed, then Next > from the lower, right-hand, side of the screen. 6 6 VX 9000E WiNG Express Manager 5. Within the Guest Operating System screen, select Linux as the guest operating system. 6. Use the Version drop-down menu to select Other Linux (64-bit), then select Next > from the lower, right-hand, side of the screen. 7. Select one network interface card (NIC) from the How many NICs do you want to connect? drop-down menu. 8. Assign a Network to NIC1, then select Next > from the lower, right-hand, side of the screen. 7 Installation Guide 7 9. Set the Virtual disk size from within the Create a Disk screen, then select Next > from the lower, right-hand, side of the screen. 10. Select the Edit the virtual machine settings before completion checkbox, then select Continue from the lower, right-hand, side of the screen. 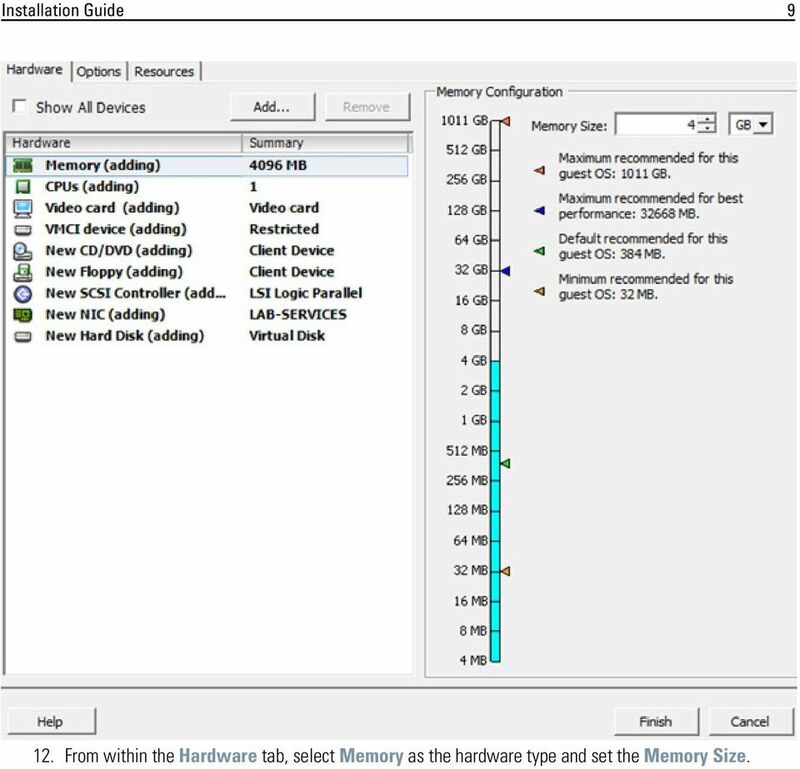 9 Installation Guide From within the Hardware tab, select Memory as the hardware type and set the Memory Size. 10 10 VX 9000E WiNG Express Manager 13. Remain within the Hardware tab, and select CD/DVD. 14. Set the device type to Datastore ISO File. Select the Browse button and select the VX 9000E ISO file. Select Finish from the lower, right-hand, side of the screen. 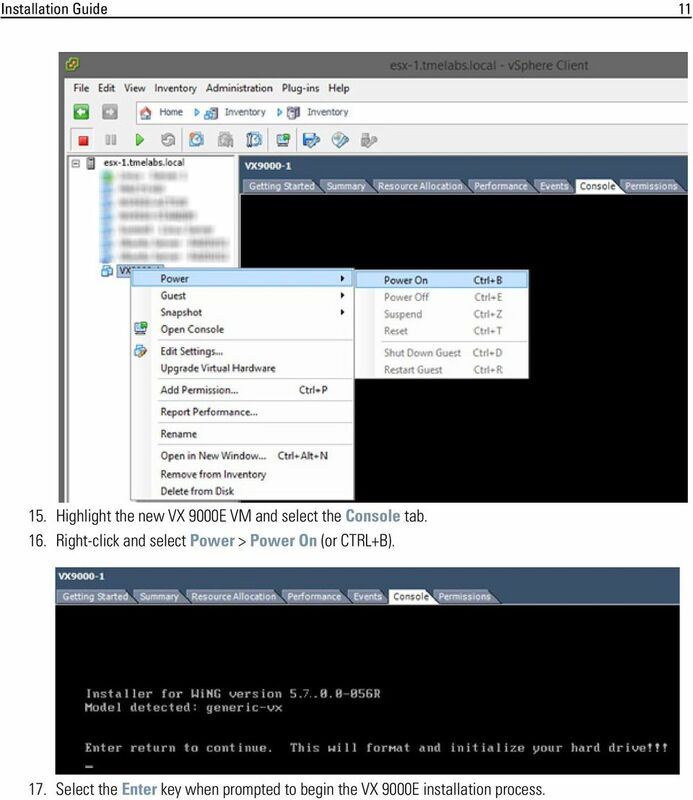 11 Installation Guide Highlight the new VX 9000E VM and select the Console tab. 16. Right-click and select Power > Power On (or CTRL+B). 17. Select the Enter key when prompted to begin the VX 9000E installation process. 12 12 VX 9000E WiNG Express Manager 18. 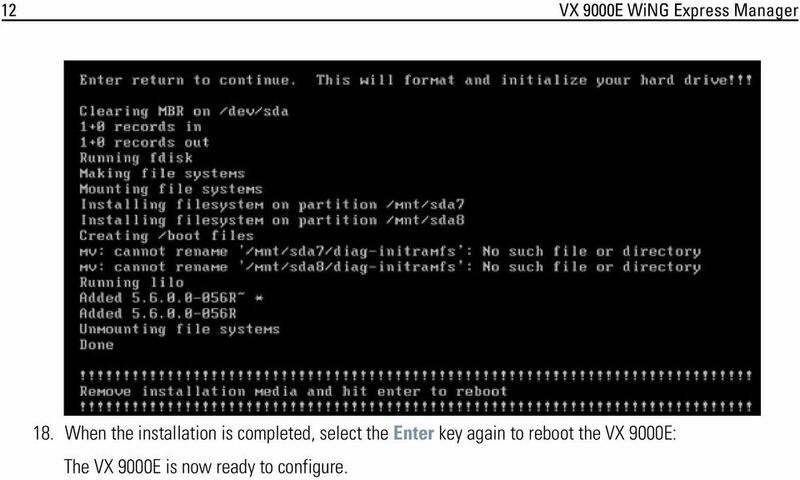 When the installation is completed, select the Enter key again to reboot the VX 9000E: The VX 9000E is now ready to configure. 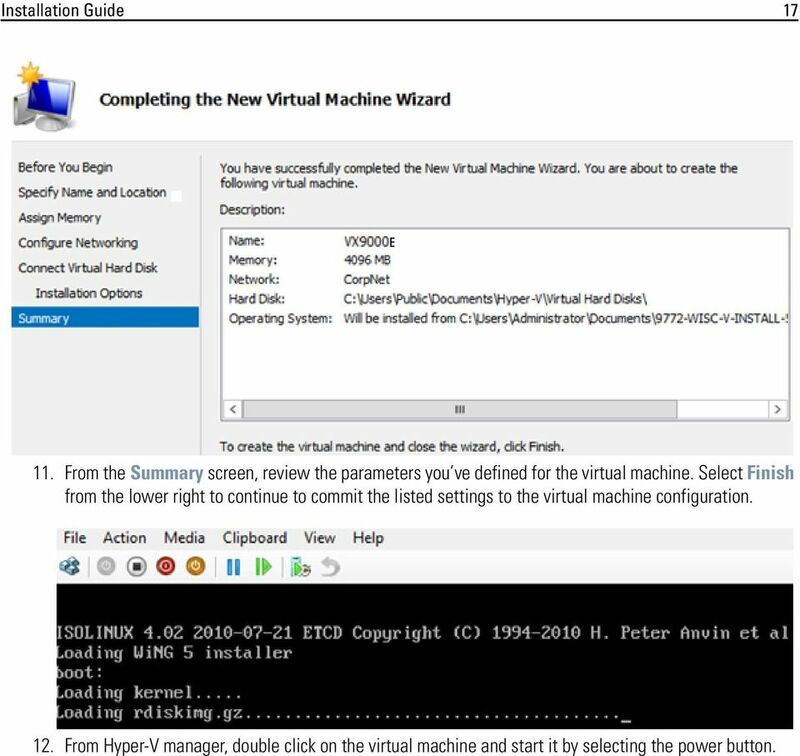 13 Installation Guide 13 Installing in a Hyper-V Environment To install the VX 9000E in a Hypyer-V environment: 1. 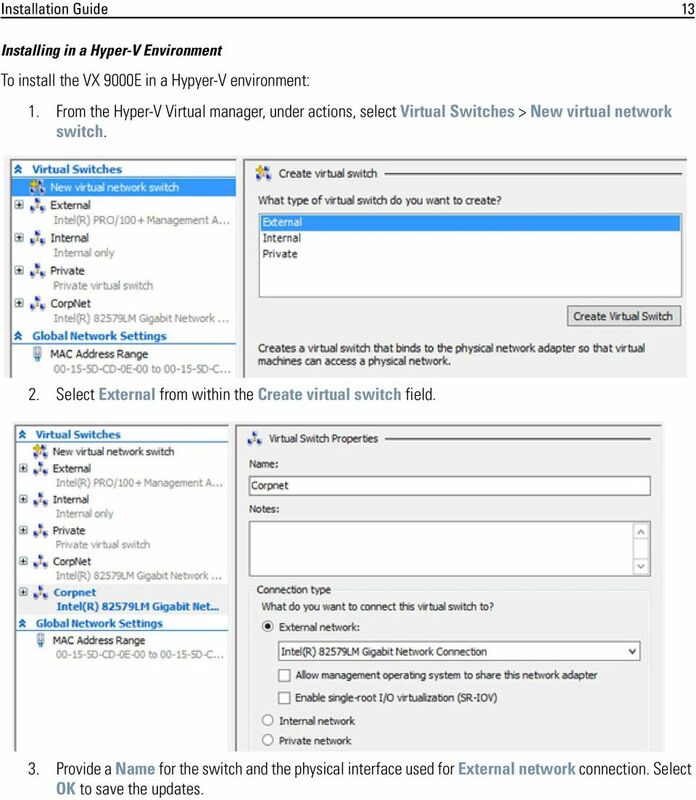 From the Hyper-V Virtual manager, under actions, select Virtual Switches > New virtual network switch. 2. Select External from within the Create virtual switch field. 3. Provide a Name for the switch and the physical interface used for External network connection. Select OK to save the updates. 14 14 VX 9000E WiNG Express Manager 4. 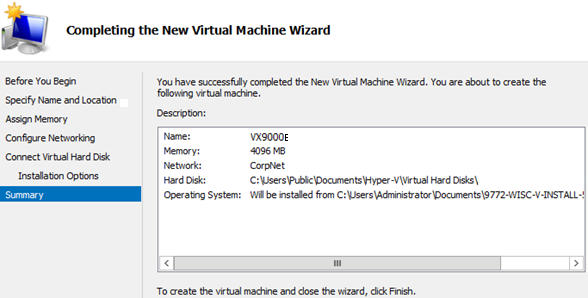 From the Hyper-V manager, select new > virtual machine to launch the New Virtual Machine Wizard used to create a virtual machine for the VX 9000E. Select Next > from the lower right to continue. 5. From the Specify Name and Location screen, provide a Name for the virtual machine and specify its location. Select Next > from the lower right to continue. 15 Installation Guide From the Assign Memory screen, enter a Startup memory (in MB) for the virtual machine. Select Next > from the lower right to continue. 7. 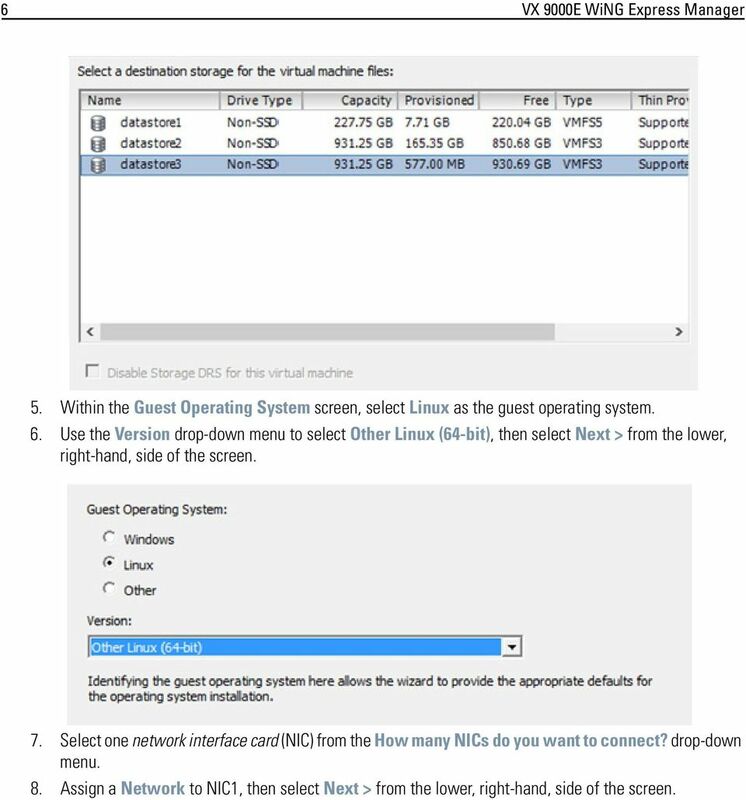 From the Configure Networking screen, use the Connection drop-down menu to select the external network connection defined earlier in this Hyper-V installation. Select Next > from the lower right to continue. 16 16 VX 9000E WiNG Express Manager 8. 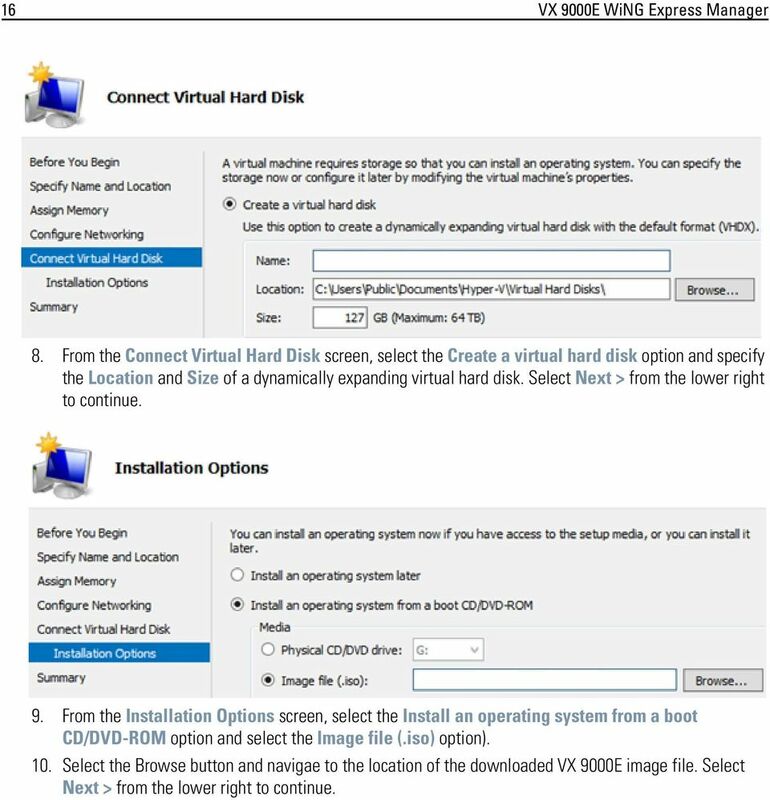 From the Connect Virtual Hard Disk screen, select the Create a virtual hard disk option and specify the Location and Size of a dynamically expanding virtual hard disk. Select Next > from the lower right to continue. 9. From the Installation Options screen, select the Install an operating system from a boot CD/DVD-ROM option and select the Image file (.iso) option). 10. Select the Browse button and navigae to the location of the downloaded VX 9000E image file. Select Next > from the lower right to continue. 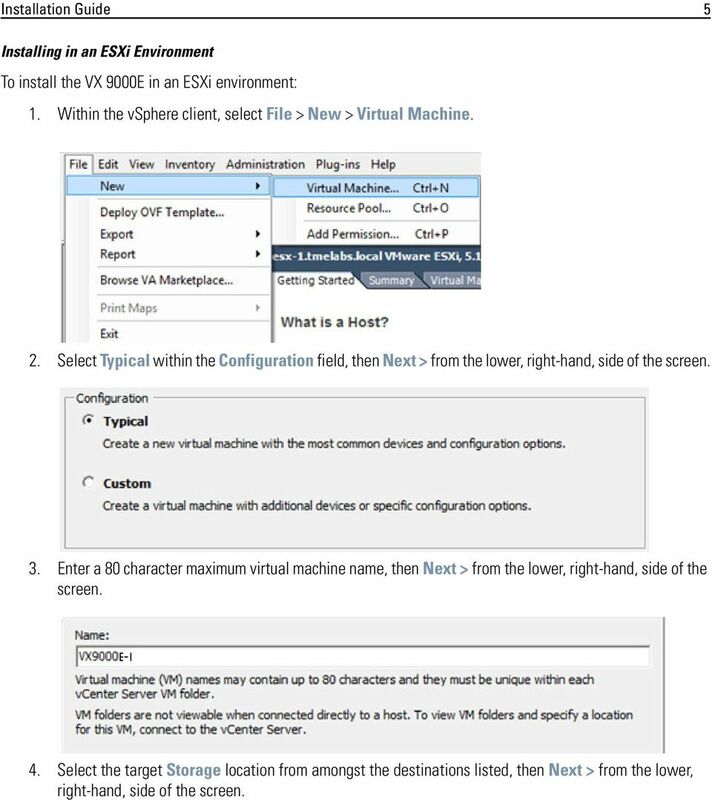 17 Installation Guide From the Summary screen, review the parameters you ve defined for the virtual machine. 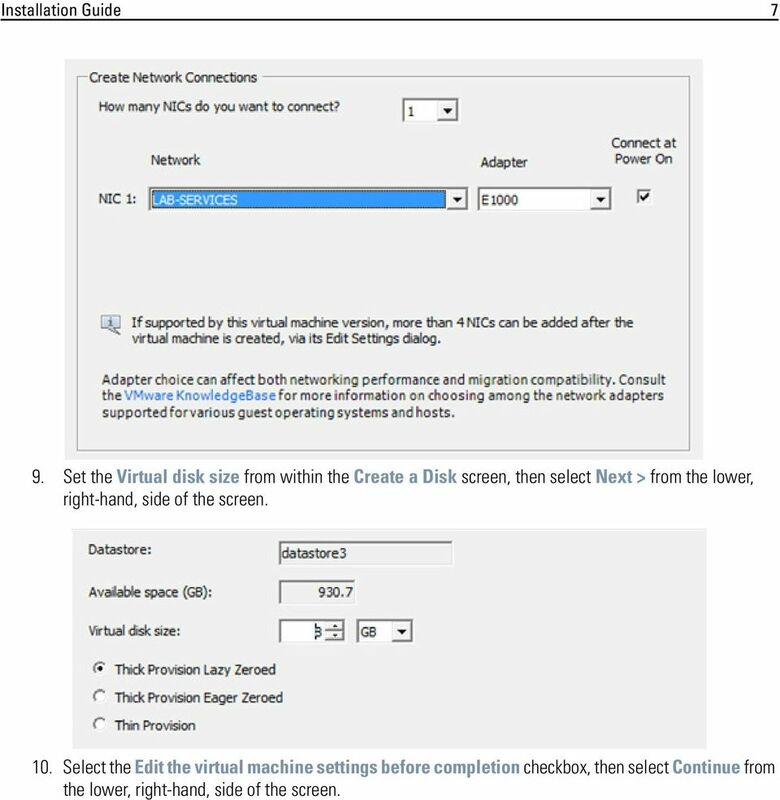 Select Finish from the lower right to continue to commit the listed settings to the virtual machine configuration. 12. 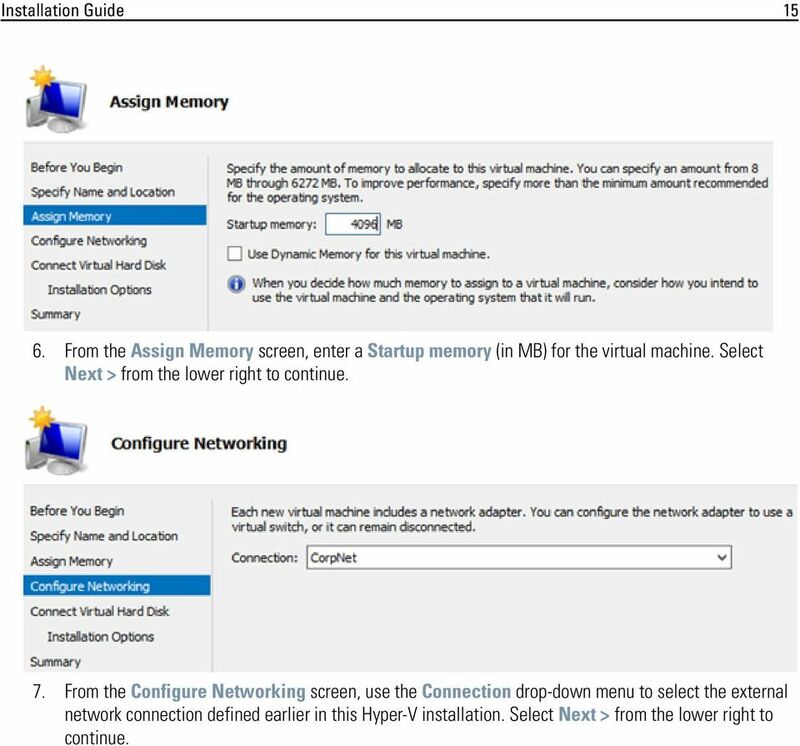 From Hyper-V manager, double click on the virtual machine and start it by selecting the power button. 18 18 VX 9000E WiNG Express Manager 13. When prompted within the console, select Enter to start the VX 9000E installation. 14. When the installation is completed, select Enter to reboot the VX9000E. 19 Installation Guide 19 The VX 9000E is now ready for configuration. 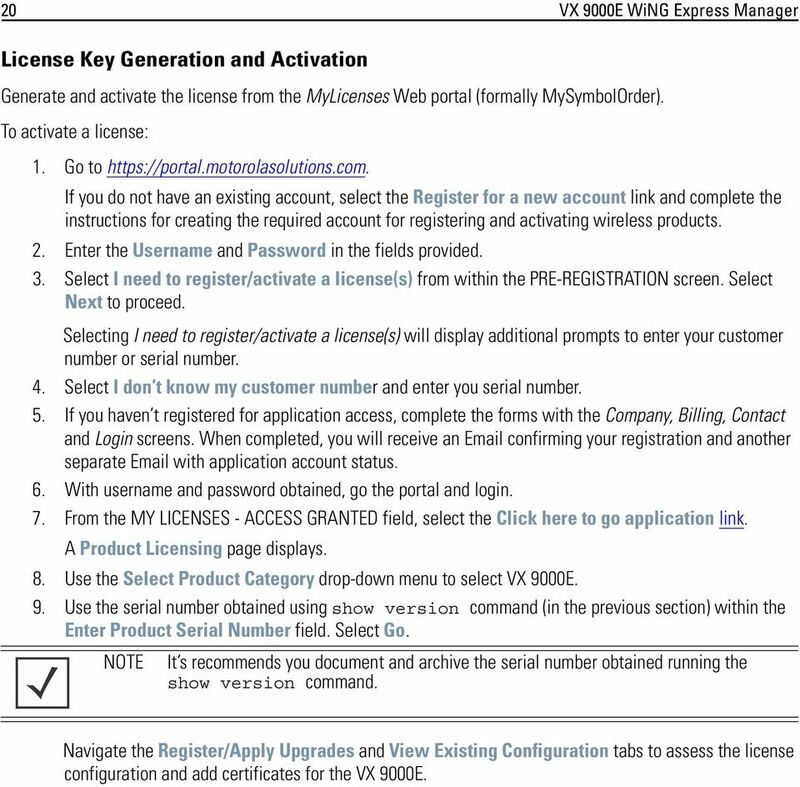 20 20 VX 9000E WiNG Express Manager License Key Generation and Activation Generate and activate the license from the MyLicenses Web portal (formally MySymbolOrder). To activate a license: 1. Go to If you do not have an existing account, select the Register for a new account link and complete the instructions for creating the required account for registering and activating wireless products. 2. Enter the Username and Password in the fields provided. 3. Select I need to register/activate a license(s) from within the PRE-REGISTRATION screen. Select Next to proceed. Selecting I need to register/activate a license(s) will display additional prompts to enter your customer number or serial number. 4. Select I don t know my customer number and enter you serial number. 5. If you haven t registered for application access, complete the forms with the Company, Billing, Contact and Login screens. When completed, you will receive an confirming your registration and another separate with application account status. 6. With username and password obtained, go the portal and login. 7. From the MY LICENSES - ACCESS GRANTED field, select the Click here to go application link. A Product Licensing page displays. 8. 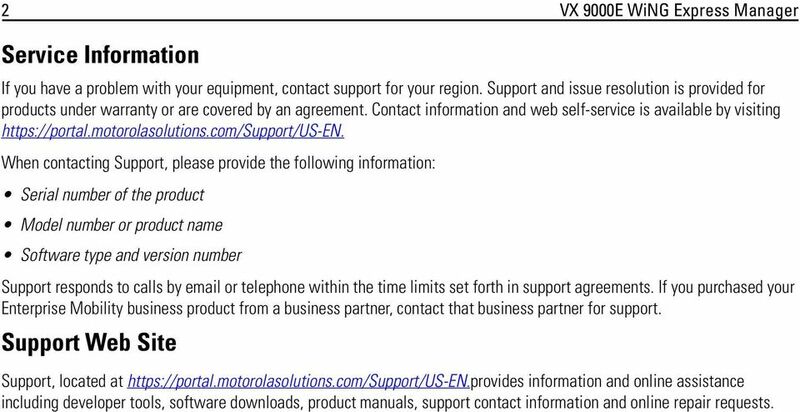 Use the Select Product Category drop-down menu to select VX 9000E. 9. Use the serial number obtained using show version command (in the previous section) within the Enter Product Serial Number field. Select Go. NOTE It s recommends you document and archive the serial number obtained running the show version command. Navigate the Register/Apply Upgrades and View Existing Configuration tabs to assess the license configuration and add certificates for the VX 9000E. 22 22 VX 9000E WiNG Express Manager 7. From the AWS management console, go to S3 and create a bucket by specifying a label with default value. 8. Select the Create Bucket button. 23 Installation Guide Specify bucket name and region where you want to run the VX 9000E. 10. Select the Create button. 11. Open a command shell and issue the following import commands: C:\>ec2-import-volume wingx.vmdk -f vmdk -b <S3 bucket name> -O <ACCESS KEY> -W <SECURITY KEY> -o <ACCESS KEY> -w <SECURITY KEY> -z <your zone, ex:-ap-southeast-1a> --region <your region, ex:- ap-southeast-1> 12. Check the status from another cmd line: C:\>ec2-describe-conversion-tasks --region ap-southeast-1 This command displays the volume to be created. Ex: "vol-7b596774" 13. Highlight the volume just created. 24 24 VX 9000E WiNG Express Manager 14. Select Create Snapshot. 15. Select the snapshot just created, right-click and select Create Image. 16. Prove an AMI Image name. Set root device name to "/dev/sda" and Kernel ID. 25 Installation Guide Select the recommended AMI kernel based on the region the table below. 18. From the Amazon Web Services My Account / Console, select AWS Management Console. 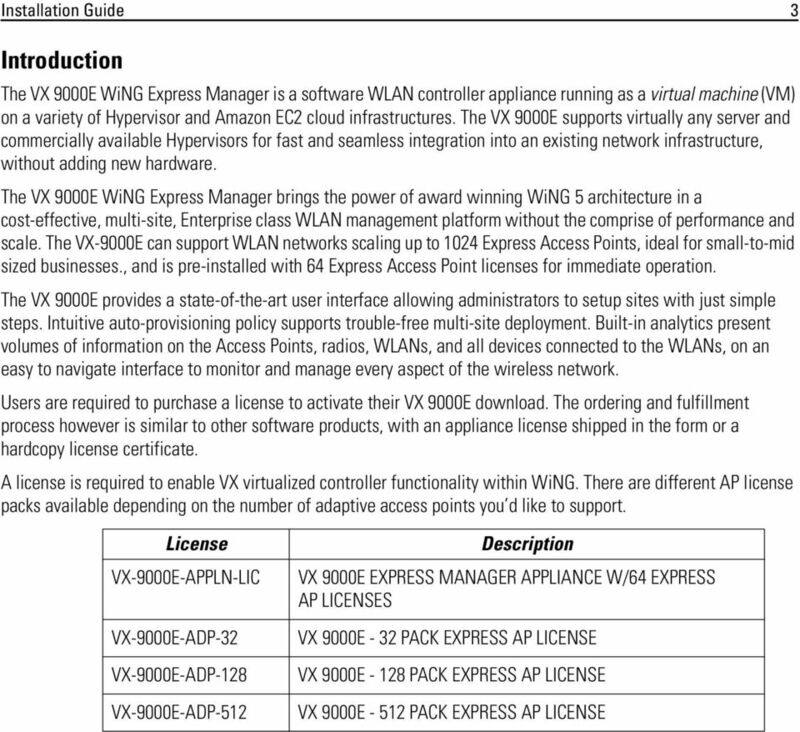 26 26 VX 9000E WiNG Express Manager 19..From the Amazon Web Services screen, select VPC. NOTE At this point in the installation, it s recommends you create a virtual data center to ensure you can re-use network supplied IP addresses. 20. From the drop-down menu on the top right-hand side of the screen, select a region where your image will reside. 27 Installation Guide Select Start VPC Wizard. 22. 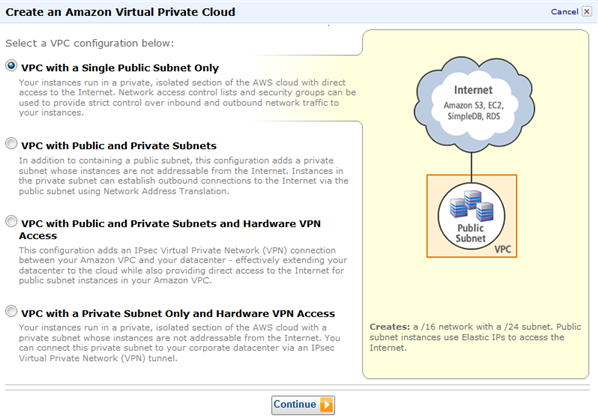 Select the VPC with a Single Public Subnet Only option. Select Continue. The credentials of the VPC display for review before creation. 23. Select Create VPC. 28 28 VX 9000E WiNG Express Manager 24. From the Amazon Web Services screen, select EC2 under Compute & Networking (on the left-hand side of the screen). 25. Expand the Images menu item on the left-hand side of the screen and select AMIs. 26. Select your image and select the Launch button. 27. From the General purpose screen, select the image appropriate to the memory constraints of your system. NOTE It s recommended you select a medium memory setting for deployments up to 5000 APs, and a large memory setting for deployments in excess of 5000 APs or deployments that utilize WiNG Analytics. 29 Installation Guide Select Next: Configure Instance Details. 29. Within the Network field, provide the IP and mask created using the VPC Wizard. 30 30 VX 9000E WiNG Express Manager 30. Within the Public IP field, ensure Automatically assign a public IP address to your instances is selected. 31. Refer to the Network interfaces section at the bottom of the screen and provide the Primary IP. 32. Select the Next: Add Storage button. 33. Within the Size (GiB) field, set the storage capacity. 8 GB is recommended. 34. From the bottom of the Add Storage screen, select Next: Tag Instance. 31 Installation Guide From the bottom of the Tag Instance screen, select Next: Configure Security Group. 36. Select the Add Rule button. 37. Use the Type drop-down menu to filter the traffic type. For this exercise, select All Traffic. 38. Use the Source drop-down menu to set the source as Anywhere. 39. Select Review and Launch. Review the instance s configuration and memory and storage utilization to ensure they re appropriate prior to launching the image. 32 32 VX 9000E WiNG Express Manager 40. Select the Launch button. A key pair screen displays prompting the administrator whether they d like to apply a key to enhance security. 41. From the drop-down menu, select Proceed without a key pair. 33 Installation Guide Navigate back to the EC2 screen, expand the Instances menu item and select Instances. 43. Select the Status Checks tab and ensure both the System Status Checks and Instance Status Checks have returned a status of passed. 44. From the EC2 Dashboard, expand the NETWORK & SECURITY menu and select Elastic IPs. 34 34 VX 9000E WiNG Express Manager 45. Select Allocate New Address. 46. Highlight allocated address. Select Associate Address. 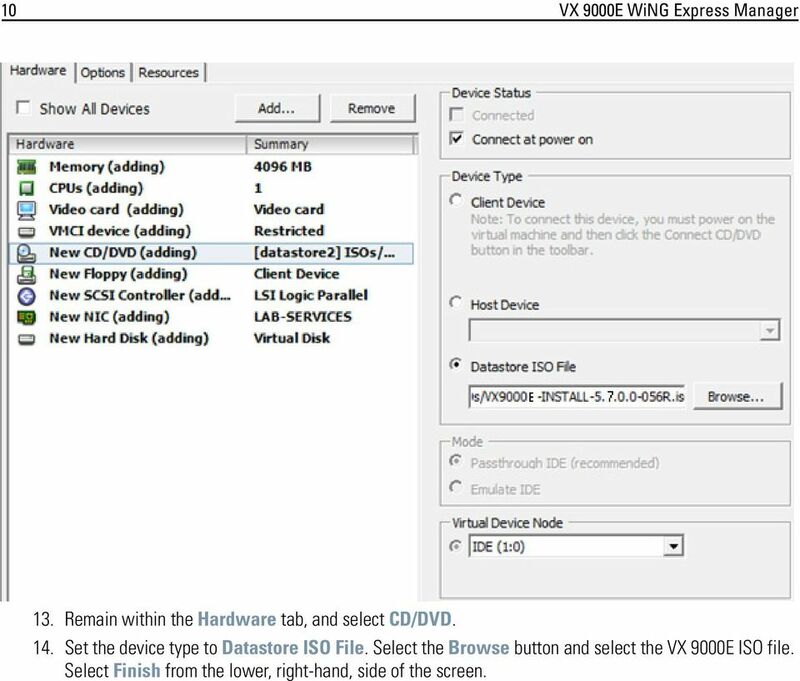 35 Installation Guide Select VX 9000E instance. Select the Associate button. 48. You are now ready to connect to the VX using the Elastic IP address and apply licenses. If you re not using VMware vsphere Client 5.1, your screens may vary. Bare Metal Server Mode (Single-Interface Deployment) 2015 Silver Peak Systems, Inc. Before You Begin Download either the Hyper-V, KVM, or Xen appliance ISO image available from the Support portal or Marketplace. ClearPass Policy Manager 6.3 Tech Note: Installing or Upgrading on a Virtual Machine This document describes the procedures for installing and upgrading ClearPass Policy Manager 6.3 on a Virtual Machine. Also you need the C-MOR ISO file. This file you will find following this link: http://www.cmor.com/video-surveillance/download-vm. This Guide will show you the installation of C-MOR Video Surveillance on a Microsoft Hyper- V server. You are able to download the Microsoft Hyper-v 2012 server on http://www.microsoft.com/en-us/server-cloud/hyper-v-server/. Multipathing I/O (MPIO) enables the use of multiple iscsi ports on a Drobo SAN to provide fault tolerance. MPIO can also boost performance of an application by load balancing traffic across multiple ports. Configure the idrac Remote Access Console If your ExtraHop system is deployed in a data center or other remote environment, you might need to remotely access the console and its power-management features.